Discussion in 'Frontier and Player Outposts' started by khixan, Jun 16, 2015. The fastest way to get to any of the Wild North builds. Ice boat or bullet rail. Due North of Wild North on smp8 and through the portal. Exits are marked for each build (excepting Bone Machine which uses the Fe(II)/Pigmentus portal). Zombies and cave spiders. Accessible from Nether Express. Coordinates -1271, -9973. 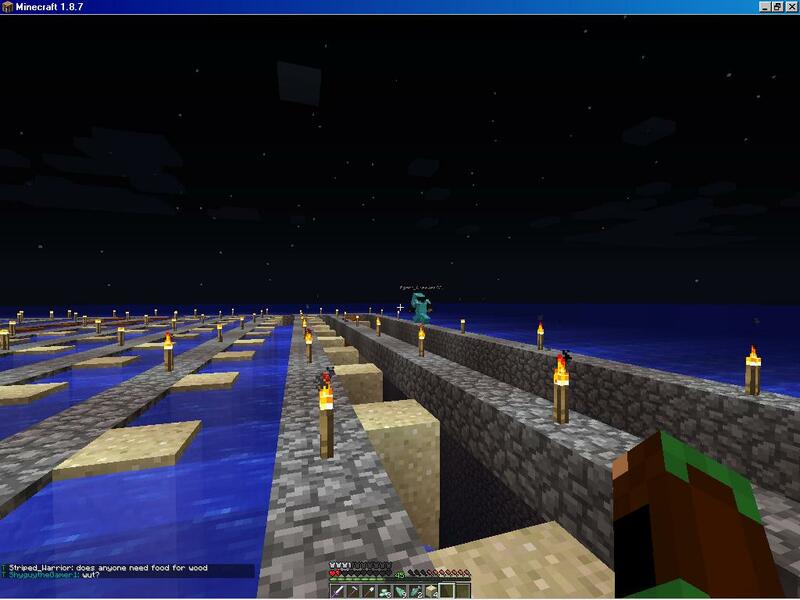 Guardian Farm (prismarine and fish). Accessible from Nether Express 2nd floor - Go UP ladders once through its portal. (Do not continue on rail once through the portal.) Coordinates -1440, -10530. Blaze grinders (4). Accessible from Nether Express. (The old rail that connects to Sushi Drop is still there also). Aggro pigman grinder/gold farm. Accessible from Nether Express (head south). Please don't AFK at or near this build! 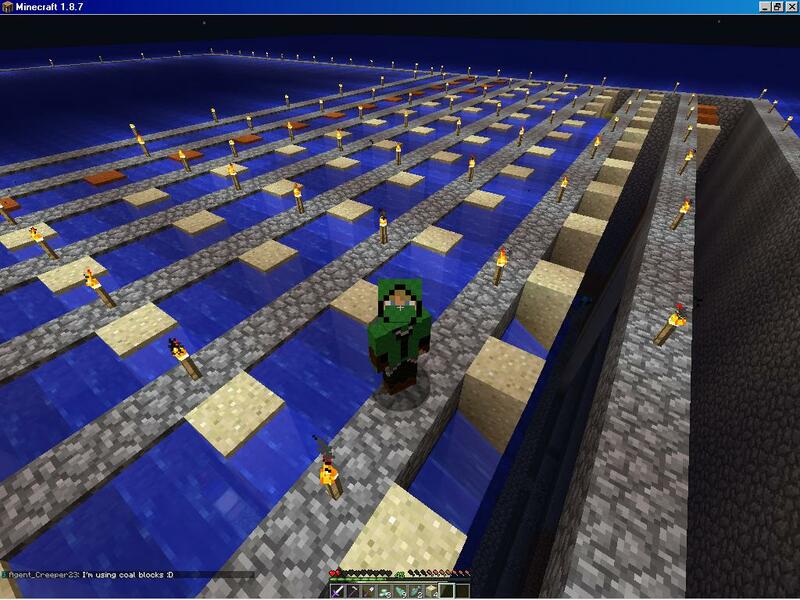 Iron farm. Accessible from Nether Express (north side). Skeleton grinder. Use the Pigmentus/Fe(II) portal from Nether Express. It is located off the road heading EAST (towards town) close to Pigmentus. Coordinates -1104, -10230. Run by BenMA. This further down the road from Bone Machine towards town (east). BYOB & S = Bring your own bonemeal and saplings. The OLD rail line that interconnects the builds does still exist though we don’t use it anymore since the Nether Express is so much faster. It still starts at -128, -9977 west of Wild North. Wither skellies and other nether fortress mobs. /Nether and go due south to the covered rail and ice boats. Go UP the ladders at the end of the tunnel. This place is not safe at all, so plan accordingly for the nether. Originally done by Sgt_Pepper04, it's been completely revamped for even better wither skellie rates. This is at the main Wild End island across from FM’s Enderman Grinder. 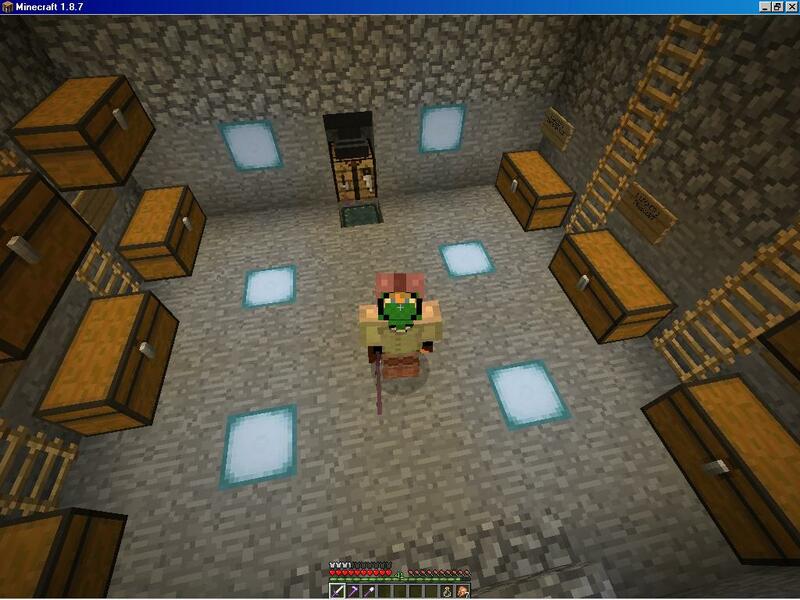 If you don't know the way out there, ask on smp8 town chat. End portal is at -775, 185 (boat or ender pearl onto RD’s island). Enjoy! Cheers all and thanks for being awesome! I am adding this for the staff below. Several mods mentioned it's hard for them to track these public builds. If I have forgotten your name on this list anywhere, please PLEASE contact me to fix it! Thank you! MrGraywolf, Jadzia, MagisterDelerius, crazy_x_gamer, ShyGuyTheGamer1, CodyGraw, Deceptious, Cuto (formerly toto_style), TBird1128, tuqueque, AyanamiKun, JohnKid, Lacronton, JDHallows, FadedMartian, Rhy (stop changing your name), Sadie_Dog, DavisAtDavis, fBuilderRS, Harp4Christ, and Tazzy_The_Best have rights to make repairs for any griefing after staff has investigated at all builds. -- jay and monster for the sugar cane farm up top in ocean, and adding onto locker room #3. --ShyGuyTheGamer1 for the a locker room. 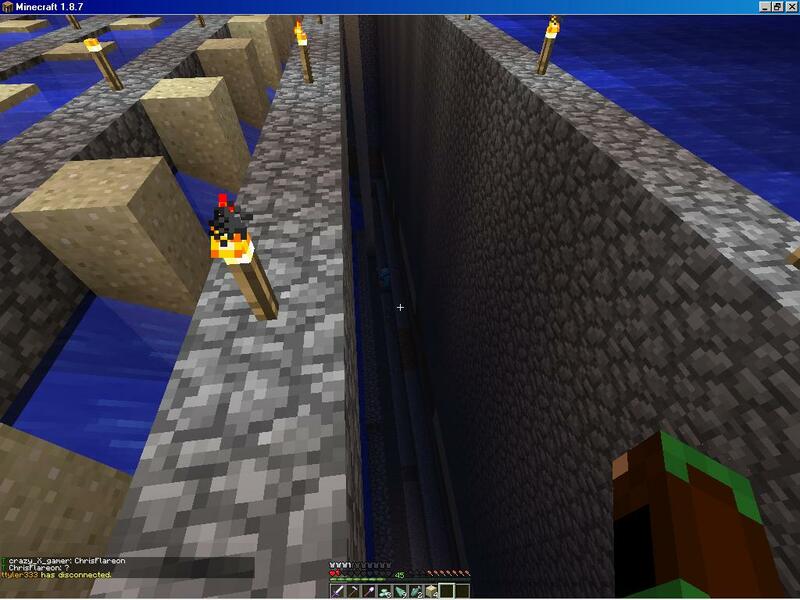 -- xxGreenPandasxx, Labat1708, ScrOcraft, and BaadGamer for all the rail improvements. -- SageCreeper, Racer, and SparkleRose for the Stables at Sushi Drop. TotoStyle, WitherTheRuler, Monkeyrancher, PeculiarPotato, GeneralWillikers, JediKittySC, EnderMagic1, ru42lines, tuqueue, SirTah, and BountyCole. ThaKloned, PrivateWillikers, Lil_Spartan_Cat, Jadzia, adrian1995, Lee1993, Paul1953, tuqueque, SealInAction, madidiot21, Keegsstar123. top_benny, haastregt, Starsphere and 57 others like this. crazy_X_gamer, Tuqueque, Agennt and 1 other person like this. Where are these "Utilities" in the wild? crazy_X_gamer, Tuqueque and Agennt like this. Locations will be announced soon Shyguy. The nether fortress hunting grounds is already up at /nether, head south, follow covered pathway. Zombie grinder is up and running. Cave spider spawners around the corner being done next! first images in the farm great work all. Thank you rdmaster, khixan,qkazoo07, masterdude13 and anyone else who helped, donations, builds, what a great crew smp8 has!!! 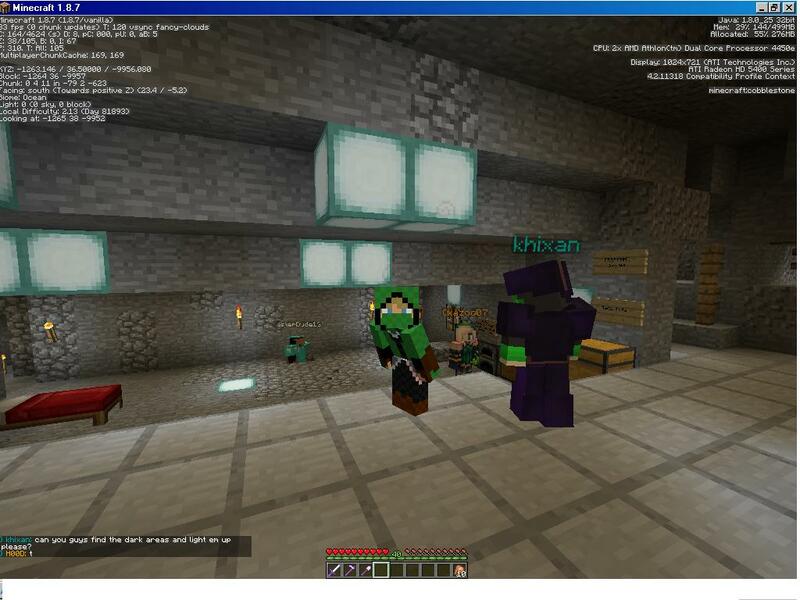 crazy_X_gamer, ChickenDice and khixan like this. Update: 3 XP grinders are done and running great. We are just making everything pretty at this point, and adding safety measures inside. Stairs needed on the entrance, closing off death drops, etc. Q, x7mx and I went to the monument and killed the elder guardians tonight. We'll work more on that too. That build generally takes 1 to 2 weeks or slightly longer depending on everyone's availability. Tuqueque, Agennt, Mutavalli and 2 others like this. Tuqueque and Agennt like this. I have an Ocean Monument already cleared out if you want to use it. I was going to make it public anyway. Tuqueque, Agennt, ChickenDice and 2 others like this. crazy_X_gamer, Tuqueque, Agennt and 4 others like this. Thank you wkramer! maybe a 2nd one? 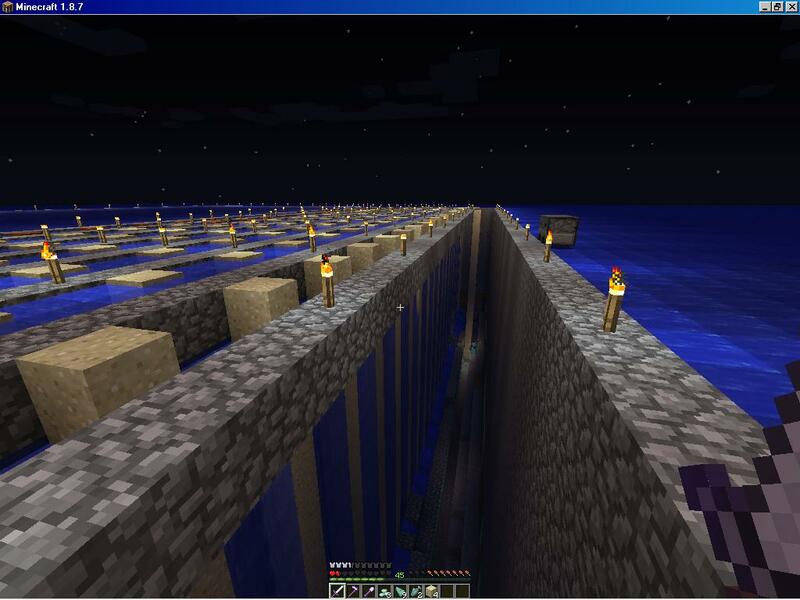 We've cleared the water from the ocean monument and started the walls and sand pillars woot woot! crazy_X_gamer, Tuqueque, H00D and 1 other person like this. you're using a texture pack that makes sand look like quartz? I use HDFlows, same one as Keralis usually uses. It makes everything smoother and crisper, less patterns. I have vision issues, especially in my left eye. 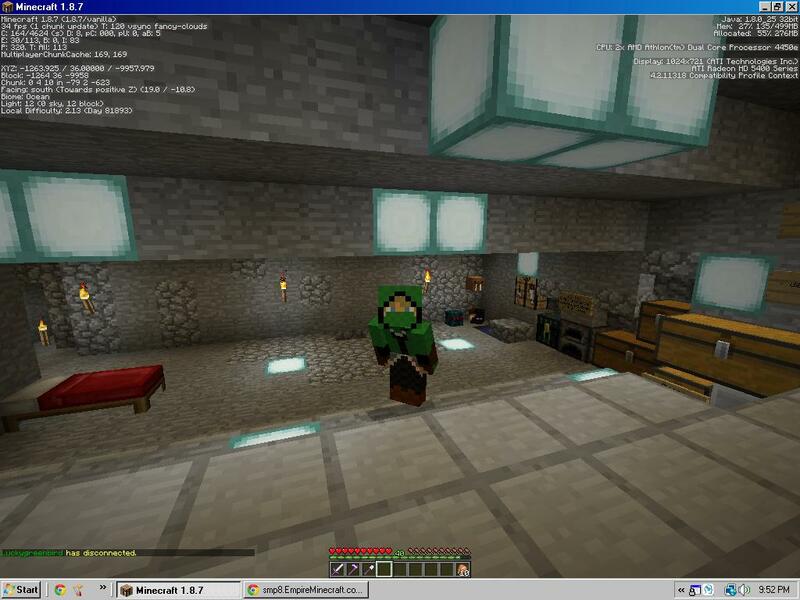 It really helps me read chat and be able to see in Minecraft. Recommend for anyone with visual impairments. Other texture packs are too busy for me to be able to see anything clearly. Turns into a big messy blur, can't tell blocks apart or read chat. crazy_X_gamer, Tuqueque and Kytula like this. crazy_X_gamer, Tuqueque, Agennt and 2 others like this. crazy_X_gamer, Tuqueque, Lordess_Spartan and 2 others like this. Come join us at the new 3 grinders! We're about to open at 7PM EST (2 minutes from now)! Coordinates are -1271 and -9973. You will need a boat to get here. It's all water. Drop down the cobble tube, there is water to catch you. Tuqueque, Agennt and H00D like this. a reminder to not crowd others while they are at the spawner,we left most of the surrounding mineshafts intact so if you are tired of waiting and want to go out to explore just go through the door and have fun(close the door behind you) ~ Please no tnt mining (coming from the tnt queen) as we do not want it to get too close to the facility,khixan will murder you if you break the spawners,or atleast the spiders will get you first. Tuqueque, ChickenDice, khixan and 2 others like this. Tuqueque and ChickenDice like this. Tuqueque, ChickenDice and H00D like this. Well, we have guardians. And they are not dying with a 35 block drop rofl. Welcome to the pit of 1 hit kill death haha! tuqueque, Kytula, Ultimamaxx and 1 other person like this. Tuqueque and khixan like this.